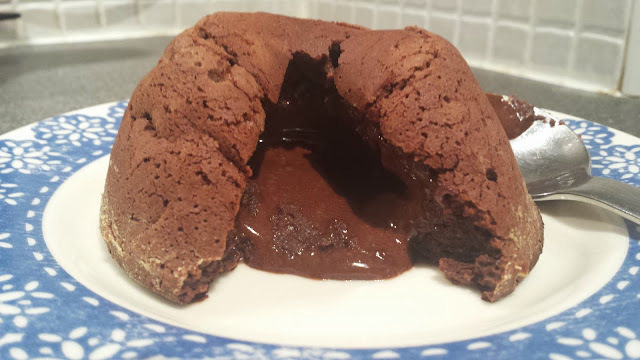 I am in love with chocolate fondants, they always look and taste incredible but up until last week I had never even attempted making them. Guess what they are absolutely easy to make especially with the recipe below. Grease and lightly flour 4x120ml dariole moulds and tap out the flour. In a bowl set over simmering water, heat the butter and chocolate together until completely melted. Beat together the eggs, yolks, and sugar with a whisk or electric beater until it leaves a trail in the mixture. Whisk together the melted chocolate and butter, it will be quite warm. Pour in the egg mixture, then quickly beat in the flour, until combined. Divide the batter into the molds. Refrigerate for 20 mins. Preheat the oven to 230c/210c Fan/450°F and bake the molds on a tray for 8 minutes. The centre will be quite soft, but the sides will be set. To remove the cakes, put a dessert plate on top of each ramekin and then flip the plate over, inverting the ramekin onto the plate. Let sit for about 10 seconds to loosen, the cake will fall out onto the plate. Serve with some ice cream or whipped cream.